Federal Judge Wayne R. Andersen issued a historic ruling Friday allowing a suit charging former Defense Secretary with authorizing torture. Rumsfeld asked the court to dismiss the case because he is a high-placed governmental official and argued that he was immune from suit even for allegations of torture. Mr. Rumsfeld also argued that due to his position, the Constitution permitted him to order interrogation techniques that are widely considered by human rights experts to be torture. The Court rejected both of Rumsfeld’s arguments and held that high-placed placed cabinet officials can be held personally liable if they authorize the use of torture. 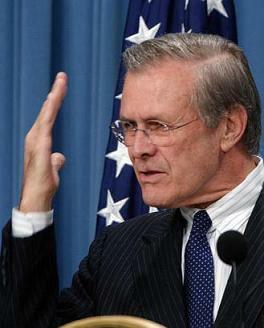 Rumsfeld allegedly issued orders allowing torture techniques which allowed Vance to be subjected to extreme sleep deprivation, interrogation for hours at a time, held in an extremely cold cell without adequate clothing or blankets, and periodically denied food and water for long periods of time. During virtually Vance’s entire three month imprisonment at the notorious Camp Cropper near Baghdad International Airport, he was held in solitary confinement in a continuously lit, windowless cell. “Plaintiffs…allege that in August 2003 Rumsfeld sent Major Geoffrey Miller to Iraq to review the United States prison system,” read Andersen’s decision. Plaintiffs claim that Rumsfeld informed Major Miller that his mission was to ‘gitmo-ize’ Camp Cropper…. These allegations, if true, would substantiate plaintiffs’ claim that Rumsfeld was aware of the direct impact that his newly approved treatment methods were having on detainees in Iraq…. Based on these allegations, we conclude that plaintiffs have alleged sufficient facts to survive Rumsfeld’s motion to dismiss on account of a lack of personal involvement… Accepting at this stage that these treatment methods were in fact used, we conclude that a court might plausibly determine that the conditions of confinement were torturous. An employee of Shield Group Security (SGS) at the time of his arrest, Vance and a co-worker, Nathan Ertel, suspected their employer of paying of local sheiks for influence in obtaining government contracts and of other illegal dealings. To combat the suspected illegal activity, Vance and Ertel became unpaid informants to the FBI in Chicago and U.S. officials in Iraq. When SGS officials threatened Vance’s and Ertel’s lives, they arranged for U.S. military forces to rescue them. But after a few hours of interrogation and then rest at the U.S. embassy, the U.S. imprisoned Vance and Ertel, beginning their nightmarish imprisonment without habeus corpus. Once they were in U.S. custody, low level bureaucrats invoked the unprecedented powers Rumsfeld had given them to imprison Mr. Vance and Mr. Ertel as “persons of interest” to the United States. Three months of interrogation followed, in which Mr. Vance was physically abused and denied the right to counsel, the right of access to the courts, and any legitimate process to challenge his illegal detention.